We offer Japanese tea ceremony, ''Sado'' experience to foreign travelers who come to Asakusa. You will experience not only tasting Japanese green tea, but you will make it by yourself. Why don't you try Japanese traditional activity by your hand? Lesson is in English, so please join us freely. Our place is located near Asakusa temple, so please drop in here to experience Japanese traditional activity when you visit Asakusa. The Sado, Japanese Tea Ceremony in Asakusa, was every bit as beautiful as I had expected. It was truely a great experience and the two ladies where very professional and friendly and everything was translated in english in a very good way. 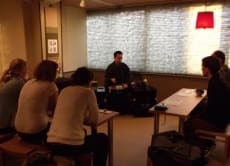 This was a highligt and I would recomend it for everyone who is interested in the Japanese Tea Ceremony.